The Vision Mercedes-Maybach Ultimate Luxury concept may hint at the Maybach GLS’ styling. Mercedes-Benz plans to build an ultraluxury Maybach SUV for global markets at its U.S. plant in Alabama. Mercedes-Benz USA CEO Dietmar Exler described the Maybach GLS as a "halo car." The Maybach brand "stands for luxury," Exler told Automotive News. "It will help build the Mercedes brand, no question." "We'll logically extend it where it makes sense," Exler said. "I cannot imagine you will have a Maybach A class. But on the top luxury cars, to have the luxury edition makes a whole lot of sense for us." Mercedes' strategic move comes as the industry's flashiest brands roll out SUVs for the price of starter homes, lured by high margins and the prospect of younger buyers. With Aston Martin and Ferrari joining Bentley, Rolls-Royce and Lamborghini, the global market for ultraluxury SUVs should grow from around 7,500 last year to above 20,000 by 2023, according to AutoForecast Solutions. About 75 percent of these vehicles will be sold in the U.S. and China. A Maybach GLS is well-timed, as consumers around the world shift to the SUV body style as their preferred vehicle and as high-net-worth populations surge, said Tim Urquhart, an analyst in London with IHS Markit. "Luxury SUVs are taking off. It's what a big section of the market wants," he said. An SUV also could help freshen Maybach's brand. The Mercedes-Maybach S sedan is associated with older demographics of the high-end market. Sedans are perceived by many consumers to be old-fashioned, said Ed Kim, automotive analyst at AutoPacific. "The ultra-high-net-worth kids want something different, and these ultraluxury SUVs certainly fit that," he said. IHS' Urquhart sees strong demand from America's Instagram-obsessed celebrities and sports stars. "The U.S. market pretty much revived the G class, the G wagon and the AMG variants of that," he said. The Maybach GLS will "appeal to the Kardashians and hip-hoppers, if they want something slightly different to the G wagon." Ultraluxury SUVs, which often share platforms with much less expensive vehicles, are cash cows for automakers. The $165,000 Bentley Bentayga, for instance, shares a platform with the $53,550 Audi Q7. SUVs generate the revenue that funds the r&d of the flagship sports cars that premium automakers have built their brands on, Kim said. "Without Cayenne, Porsche would not have the kind of money available to make 911s," he said. Mercedes launched U.S. manufacturing in Vance Alabama in 1997, building a single truck-based M-class SUV using low-cost supply lines and plastic trim parts. Present-day Mercedes-Benz U.S. International — as the factory is officially known — bears little resemblance to those days. In addition to preparing for the new Maybach, the plant is gearing up to build the next-generation GLS. The plant is also in the early stages of a $1 billion upgrade as Mercedes prepares for the next revolution in the auto industry: electric vehicles. 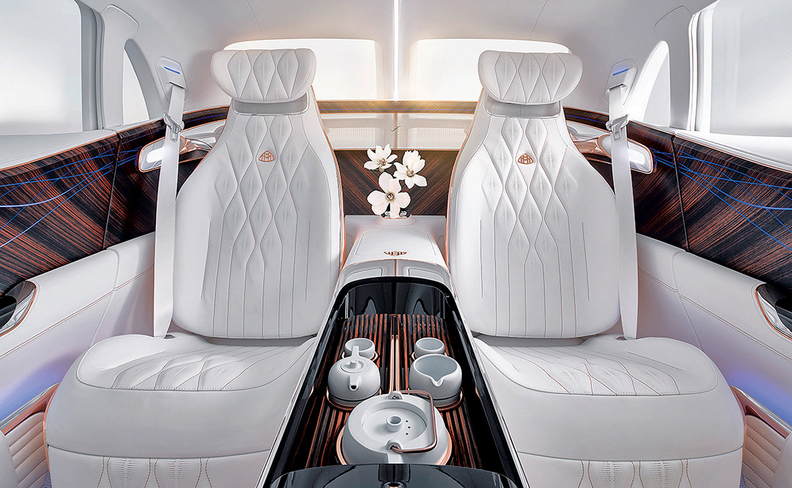 The Maybach concept shown in Beijing featured high-end materials. The Alabama operation will receive a battery plant — twice the size of the original auto factory — and will begin producing EQ-series electric vehicles in the early 2020s. The plant is now the global production hub for the GLS, GLE and GLE Coupe. The factory, which has the capacity to build more than 300,000 vehicles each year, is the second-largest vehicle exporter in the U.S. About two-thirds of the utilities produced in the plant are exported. 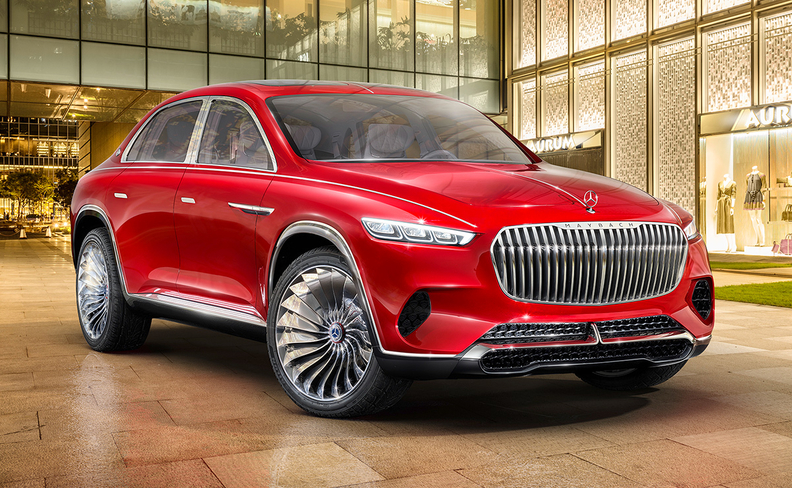 "It doesn't really makes sense to tool up in China for a couple thousand Maybach SUVs, when the Alabama plant is building [more than] 50,000 units of the GLS annually," Fiorani said. Mercedes gave a hint of how a Maybach GLS might be styled when it shared its Vision Mercedes-Maybach Ultimate Luxury concept last year at the Beijing auto show. That concept combined design elements of an SUV with a sedan. The interior featured high-end materials, such as ebony, white nappa leather seats and rose-gold diamond stitching. The series-production Maybach SUV will be based on the next-generation GLS class, which will include Mercedes' new infotainment system and a new interior and go on sale in the U.S. this year. A GLS 450 model is expected with an inline-six engine, delivering 360-plus hp. Bringing the Maybach brand to the new GLS "is pretty opportune," Exler said. "And I think it's a really, really good strategy. A fair amount of the population is doing well, so luxury sales will stay very strong. There is room for this subbrand." Maybach had been a 1930s-era brand. Daimler revived Maybach in the late 1990s as a standalone ultra-premium brand that shared parts with Mercedes cars. But met with sluggish sales, Daimler discontinued the Maybach brand in 2013, only to bring it back as a Mercedes subbrand a couple of years later. It is still early in the rarefied world of $300,000 SUVs. But the competition is already intense. At least half a dozen brands are now competing in the space. Two years ago, Bentley launched the Bentayga, kick-starting the trend of ultraluxury SUVs. Last year, Lamborghini launched its $200,000 Urus, while Rolls-Royce rolled out a $325,000 Cullinan. By the end of 2019, Aston Martin will have begun deliveries of the DBX, while Ferrari will wait until 2022 to launch its recently announced Purosangue. Even Bugatti has indicated it might develop an SUV. Lamborghini, known for two-door exotics such as the Countach, Diablo and Murcielago, expects the Urus to double the brand's global sales to 7,000 vehicles in 2019. The Cullinan's arrival in showrooms late last year quickly translated into an order bank that's full through July and has pushed Rolls-Royce to capacity at its production plant in Goodwood, England. "I would like to have a little bit more supply," Martin Fritsches, CEO of Rolls-Royce Motor Cars Americas, told Automotive News this year. "And I don't get it because we are running on 100 percent of production capacity, increasing the production capacity throughout the weeks and months, but still not being able to catch up to demand." To boost production, Rolls-Royce added 200 employees to its plant last year, increasing its head count to 2,000.